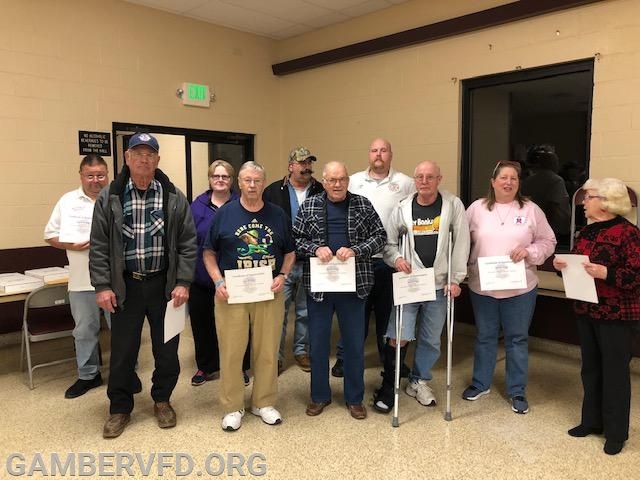 The Gamber & Community Fire Company presented honors and awards to its members for 2018 after the regular company meeting on Monday, March 18, 2019. 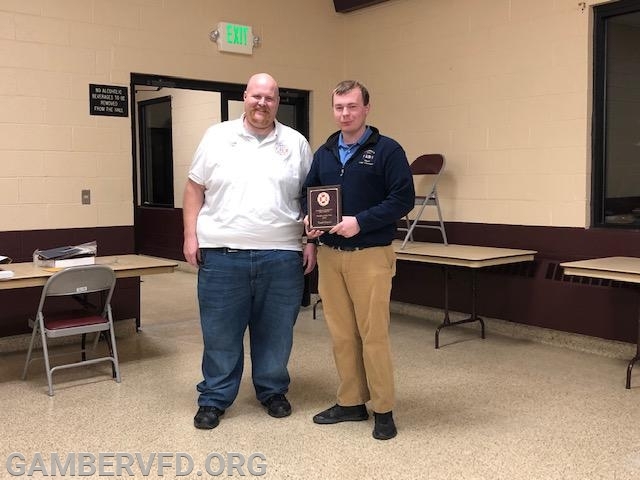 The Gerald L. Lindsay Memorial Firefighter of the Year Award was presented to Firefighter William Reardon. Chrissy Green was presented with the Herman Hoff Memorial Award for outstanding service in fund raising. Jeannie Green was honored as the Administrative Member of the Year. 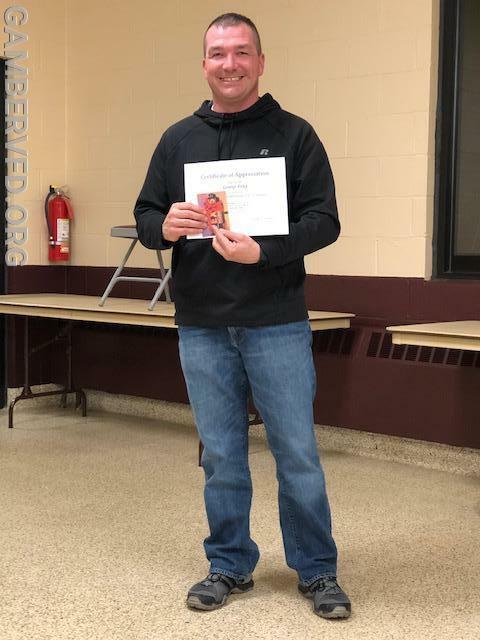 Rookie of the Year went to Firefighter Todd Tracey. A Chief's Unit Citation was also presented during the meeting by Chief Charlie Green. 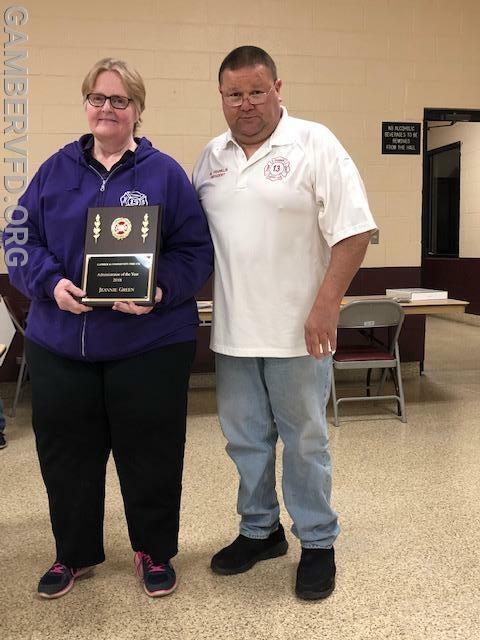 The award recognizes the efforts of Gamber members on July 25, 2018 when a series of heavy storms moved through Carroll County. In under five hours, crews responded to fourteen swift water rescue calls, spent time in two other fire stations, and rescued a total of eleven people from the water. Members recognized included: Sean Baldwin, Dale Bollinger, Bruce Bouch, Shawn Broughton, Jack Brown, Joel Caple, Shawn Chenoweth, Jeff Fleming, Mike Franklin, Chad Hastings, Jeremy Hutton, Patrick Livesay, Clay Myers, Joseph Petrowicz, Ian Runkles, Bo Stansbury, George Syfert, Chris Windsor, and Derek Zavetz. 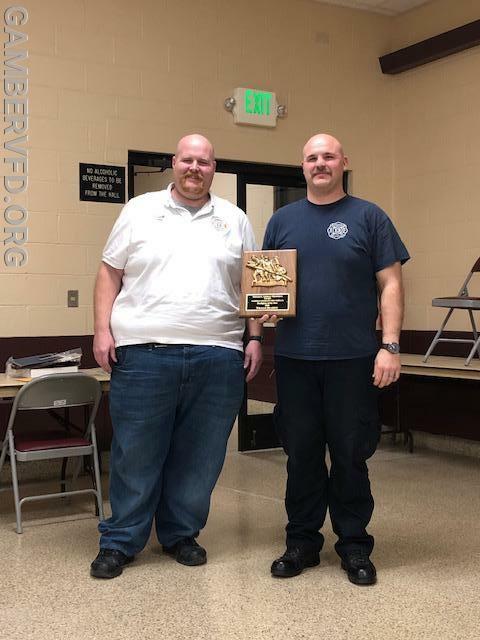 Chief Charlie Green (l) presents the Gerald L. Lindsay Memorial Firefighter of the Year Award to Firefighter William Reardon. Chief Charlie Green (l) presents the Rookie of the Year award to Firefighter Todd Tracey. 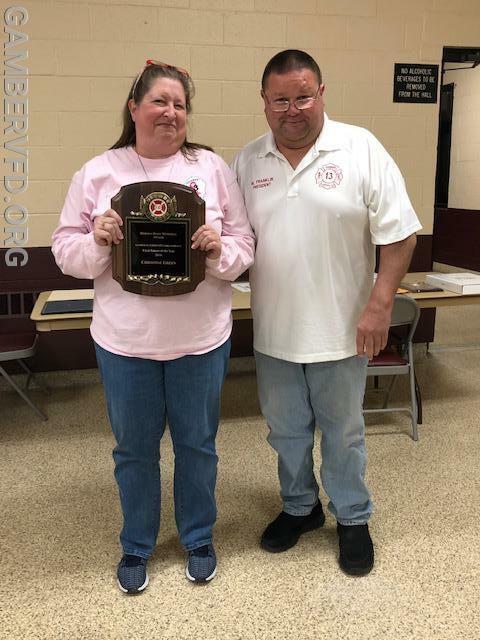 President Mike Franklin (r) presents Chrissy Green with the Herman Hoff Memorial Award for outstanding service in fund raising. President Mike Franklin (r) honors Jeannie Green as the Administrative Member of the Year. 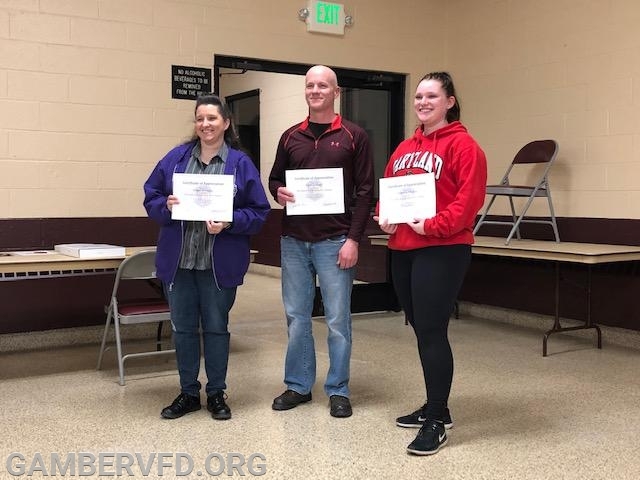 The three members with the most EMS training hours for 2018 (l to r) are Bridget Weishaar, Kevin Lentzner, and Alexandra Mitchell. 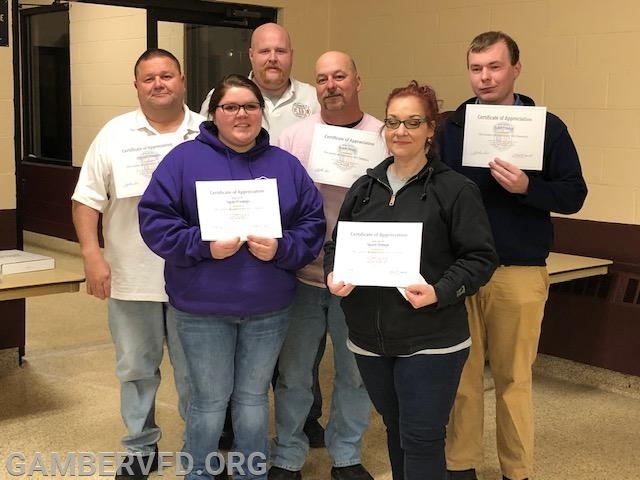 Six members with the most suppression training hours for 2018 (l to r) are Mike Franklin, Emily Franklin, Charlie Green, Frank Smith, Stacia Hutton, and Todd Tracey. 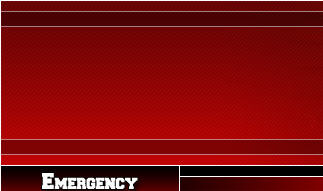 George Fritz also was honored for being in the top ten most suppression training hours in 2018. 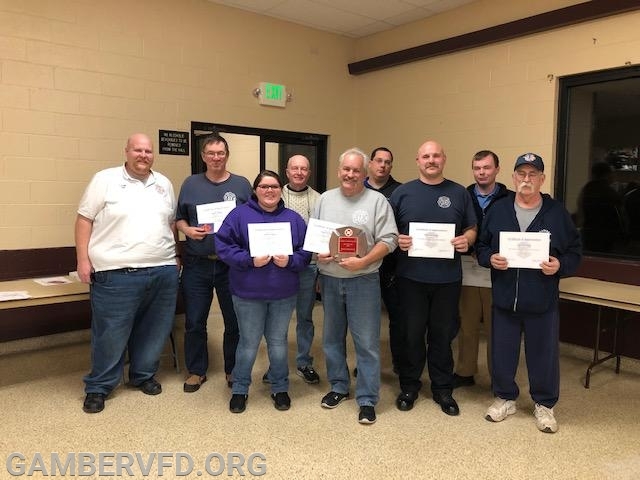 Gamber members with the most fire suppression/rescue/water rescue calls for 2018 (l to r) are Charlie Green, Chuck Doyle, Emily Franklin, Clay Myers, Shawn Chenoweth, Chad Hastings, William Reardon, Todd Tracey, and Dale Bollinger. 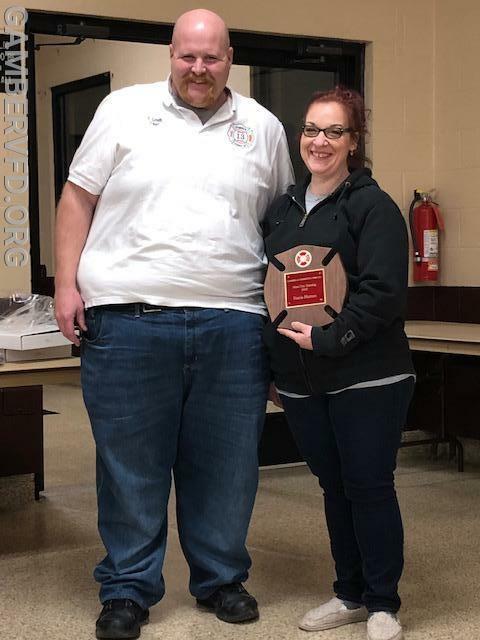 Chief Charlie Green (l) presents Firefighter Stacia Hutton with a plaque recognizing her for the most training hours for 2018. Gamber members who contributed the most fund raising hours (l to r) are Mike Franklin, Bill Sullivan, Jeannie Green, Lee Kestler, Mike Sullivan, Kenny Linton, Charlie Green, Stan Mertz, Chrissy Green, and Nancy Zepp. Chief Charlie Green awarded a Chief's Unit Citation to Gamber members for their work on July 25, 2018 when a series of heavy storms moved through Carroll County. Members include (l to r) Shawn Chenoweth, Bruce Bouch, Mike Franklin, Joseph Petrowicz, Joel Caple, Bo Stansbury, Chad Hastings, Dale Bollinger, Jeff Fleming, Clay Myers, and Jack Brown.